* anecdotally, I spent half an hour trying products in the house for any packaging with a QR code to test and drew a blank. Is it just me? I distinctly remember many things coming with a QR code on the box a few years ago, yet they've now disappeared. Odd! 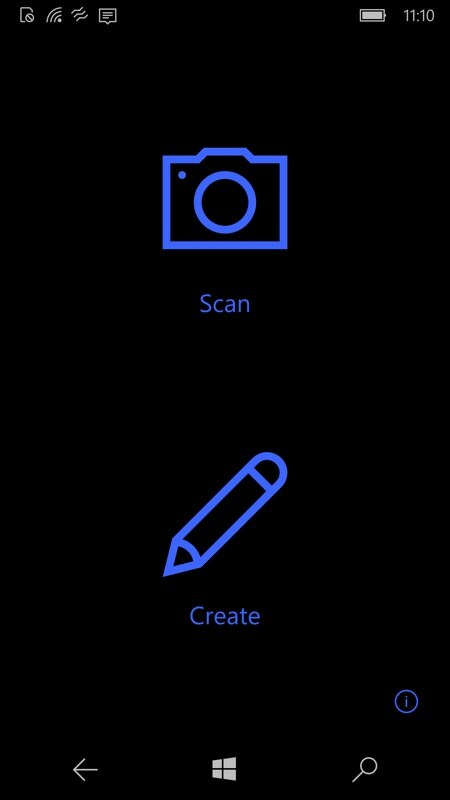 QRafty is the ultimate QR code management application on Windows 10, integrating smartly with default system apps to handle QR codes. With QRafty transferring data between devices is as easy as pointing one’s camera to another’s screen - no setup needed. 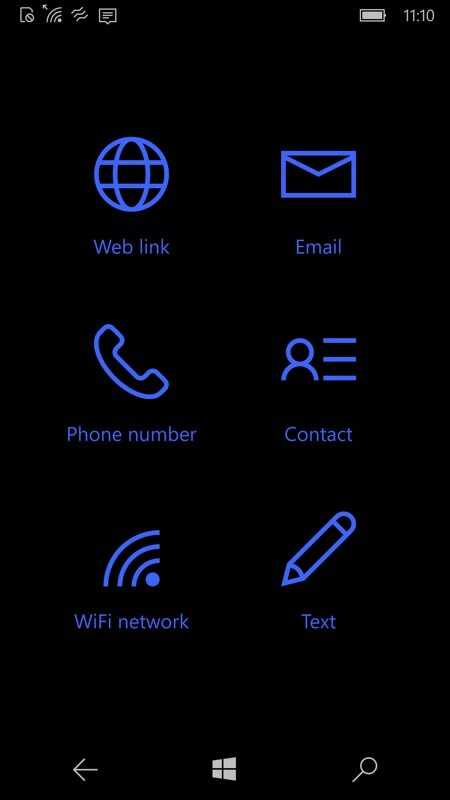 Since it does not store or transmit (as a matter of fact, QRafty does not access the internet at all) any of the information it creates or reads, QRafty is a great way of transferring sensitive data between airgapped devices: no network/Bluetooth/NFC transfers to sniff or cloud to worry about. For someone who thought that QR codes were basically representations of web URLs, map locations, and so on, to realise that anything that can be encoded in plain text can also be encoded in QR form is something of a revelation. To take things to the extreme, you could could encrypt some secrets (shhh, don't tell GCHQ!) 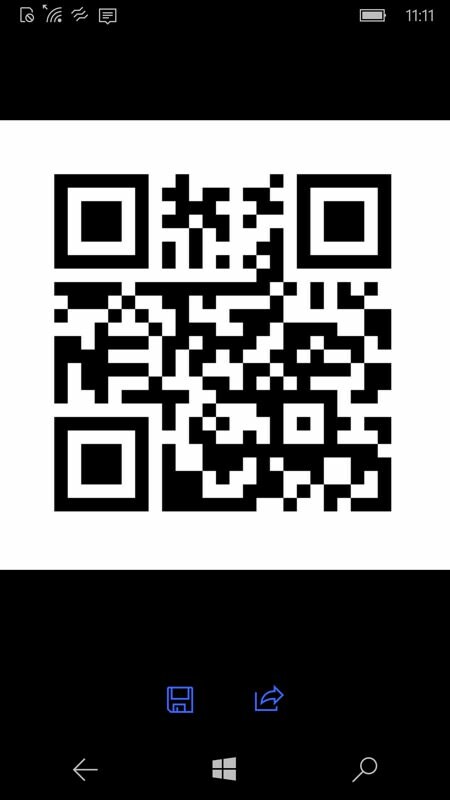 into text form and then encode them again graphically, into QR form. You can then pass these to yourself on another device, or to a friend or colleague, visually, with no need for Internet, Wifi or Bluetooth - in other words, no electronic trail or interception possibilities. Now, admittedly, passing information from one air-gapped device to another is somewhat niche, but think about it. 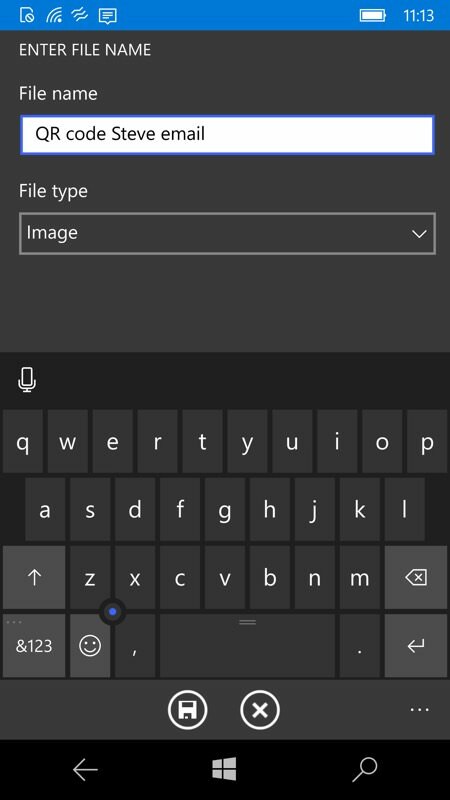 I'm sure there are multiple times each week when you want to pass a paragraph of text from your phone to your Windows laptop or vice-versa, or from your Windows phone to your Android tablet. That sort of thing. Yes you could email it to yourself, you could play Russian Roulette (will it work?) with Bluetooth, you could mess around with over-the-air clipboard utilities and schemes. In fact, there are a hundred ways to do this. But this is the first I've seen that uses light! First of all, the basics - yes, QRafty can 'Scan' a QR code and display the contents or - if a URL - head you to the destination. Enough. You're familiar with how that works! 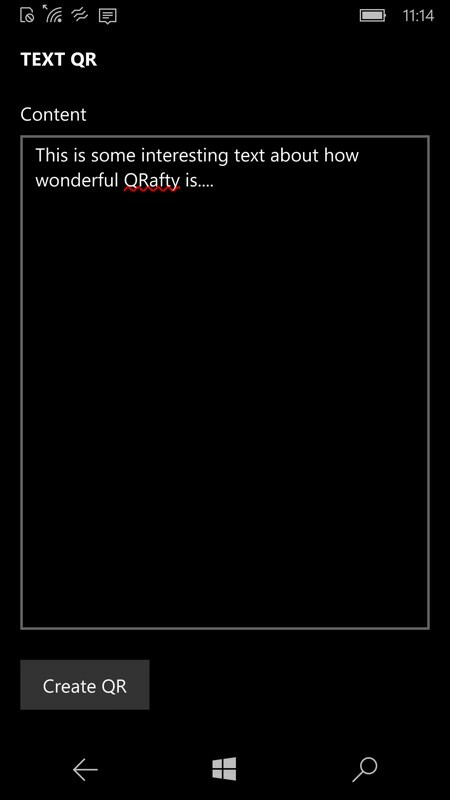 The 'Create' part of QRafty is where it gets interesting. Here are the six content types, though all, ultimately, devolve to the last, plain text, perhaps with some URL qualifiers thrown in. (right) Here, I'm trying my email address, as a possible way for people to pick it up by scanning this code - perhaps on my web site, etc? 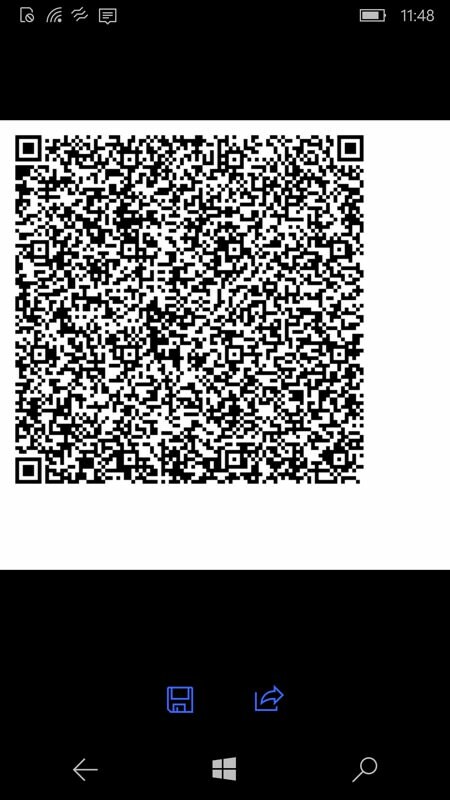 QRafty encodes this instantly into this QR code (try it, if you don't believe me - in fact, try any of the codes on this page), and (right) scanning this on an Android phone (just as an example) pops up the decoded email address easily. 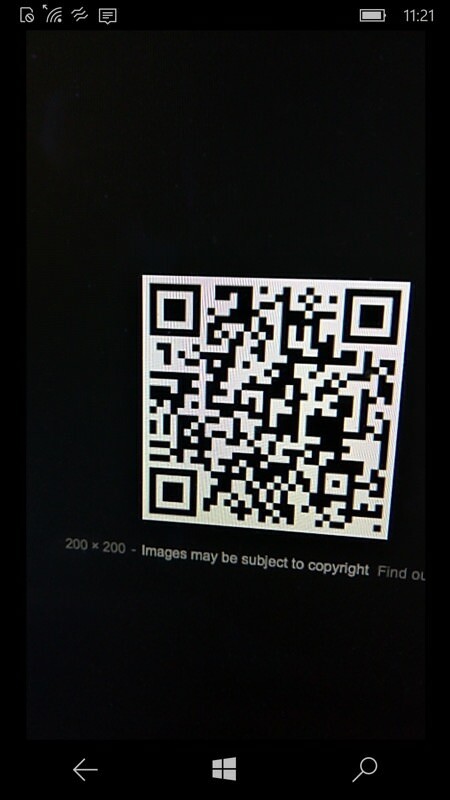 ...and here's the resulting QR code. You can see that the graphical density has increased massively, to cope with the many hundreds of characters of text; (right) Scanning this on my Android phone, I had to resort to a more capable QR scanner (built into Samsung's browser as an extension, in this case), but the system still works. 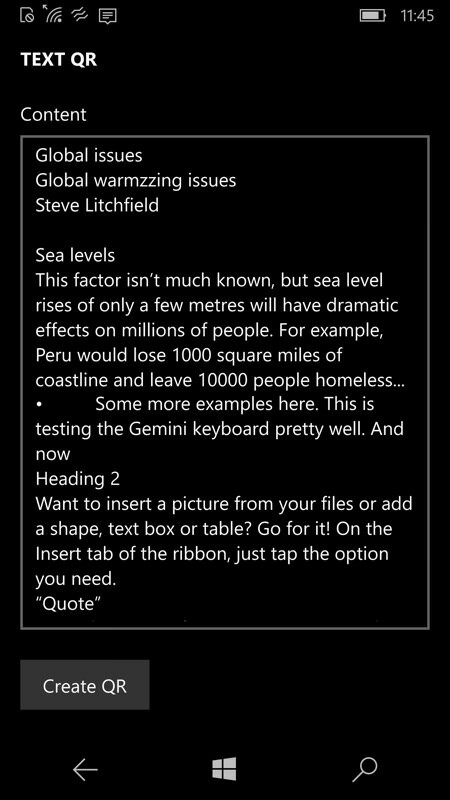 The text was nonsense to start with and even the rudimentary formatting has been lost, but the text is all there. This last example reveals the limits of using QR code for information transmission - it's limited by the size and resolution of the 'transmitting' phone and by the imaging capabilities of the 'receiving' phone. Here I had a QHD Lumia to display and a class-leading Galaxy S9+ to read, but even with this combination I don't think I could push much more text without things breaking down and - at worst - gibberish and uncertainties creeping in! 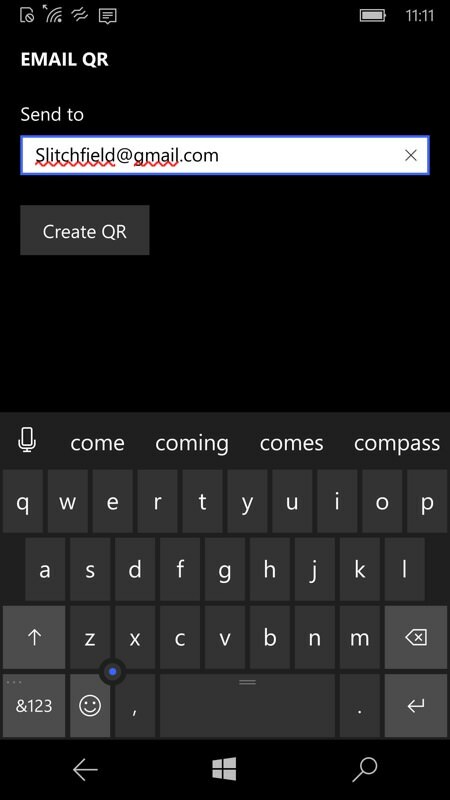 QR-ing text from device to device (phones, tablets, computers, etc.) is an interesting leap of lateral thinking. I guess it's always been possible, with the right software, and perhaps it's that the use case is utterly niche that has stopping a developer from bringing this front and centre... until now! With the focus on QR generation rather than scanning, the latter's functionality is limited, compared to other scanners. For example, there's no log/history of codes scanned, for later retrieval and link following. But as I said at the start, QR codes still aren't commonplace in 2018 - surprisingly - so it's good to see QR making a small comeback here, with some clever lateral thinking! You can grab the 14 day free trial of QRafty UWP here in the Store. After that it's a £1 or so to carry on using it forever. Bargain!